The first challenge facing any collector is determining the periods and divisions of India in which to specialise. Fortunately these divisions are fairly clear-cut, with philately largely following political history. Prior to 15 August, 1947, the day of independence for the Dominion of India, the title ‘India’ referred to the whole sub-continent – though never Ceylon, now Sri Lanka – much of which comprised ‘states’ both large and small, ruled by local dynasties with varying degrees of allegiance to the British Crown. There were over 500 such states in 1947, some of which issued their own stamps. It is important to note that not all the ‘sections’ in Indian philately are catalogued under ‘India’; for instance various Indian stamps overprinted for use in Straits Settlements, are listed with ‘Malaya’. Pakistan was created by the partition of India in 1947. Stamps were issued by France and Portugal for their colonies in India. Indian stamps were also used at various times in Somailand, Zanzibar, Persia and Iraq. After the Seven Years War of 1756 to 1763, which confirmed British predominance in the sub-continent, the ‘Honourable East India Company’ gradually extended its area’s suzerainty. Indian pre-stamp markings, on cover and piece, have always been widely collected because they are inter-linked with British postal history, notably mail to Britain marked ‘INDIA LETTER’ together with the name of a port, which date from the first half of the 19th century. From the first stamps in 1854 all the world’s major catalogues follow the same listing sequence, commencing with 1852’s ‘Scinde Dawk’ local issue and then the first true stamp issue, made by The East India Company in 1854 to 1855, inscribed ‘INDIA’ and with a portrait of Queen Victoria. In 1855 a new series of Victoria portrait stamps inscribed ‘EAST INDIA’ was introduced. After the suppression of the Indian rebellion of 1857, the British Crown assumed direct administrative control. Stamps were still inscribed ‘EAST INDIA’ but in 1865 a watermark featuring the head of an elephant was introduced on a set of seven basic values – many shades exist. With the commencement of stamps for the ‘Feudatory States’ we reach the first of the major ‘divisions’ of Indian philately. These were native states, mostly still ‘feudal’, some with their own currencies and postal systems. The first were issued in Junagadh in 1864, listed by catalogues under ‘Soruth’ as that is the Hindi word that appears on the stamps; Jammu and Kasmir issued stamps from 1866, Hyderabad in 1869; many others followed. All these stamps have distinctive designs, not bearing the portrait of Victoria, who became Empress of India in 1877, at which time Indian stamps were re-inscribed with ‘INDIA POSTAGE’. 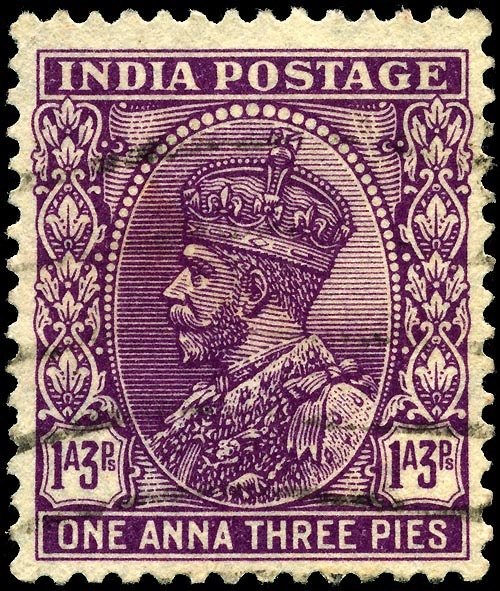 In the mid 1880s stamps began to appear for the Indian Convention States. These stamps were overprints on the imperial issues depicting Victoria, and usually supplied overprinted from the printers. They were valid within the State, or to any destination in British India. When India, minus Pakistan and Burma, was ‘elevated’ to Dominion status within the British Commonwealth, on 15 August, 1947, no commemorative set was released. A belated Indian Independence three-value appeared later in 1947, a single on 21 November showing the new national flag, and two values on 15 December depicting the Asoka capital and a Douglas DC-4 aircraft. A new constitution was written, effective in January, 1950 with the proclamation of the Indian Republic. 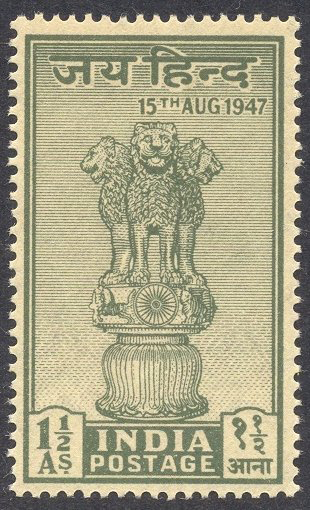 On accession the postal operation of each state was incorporated by the Indian GPO, and the native states stamps soon invalidated. This period of transition is much studied by philatelists. 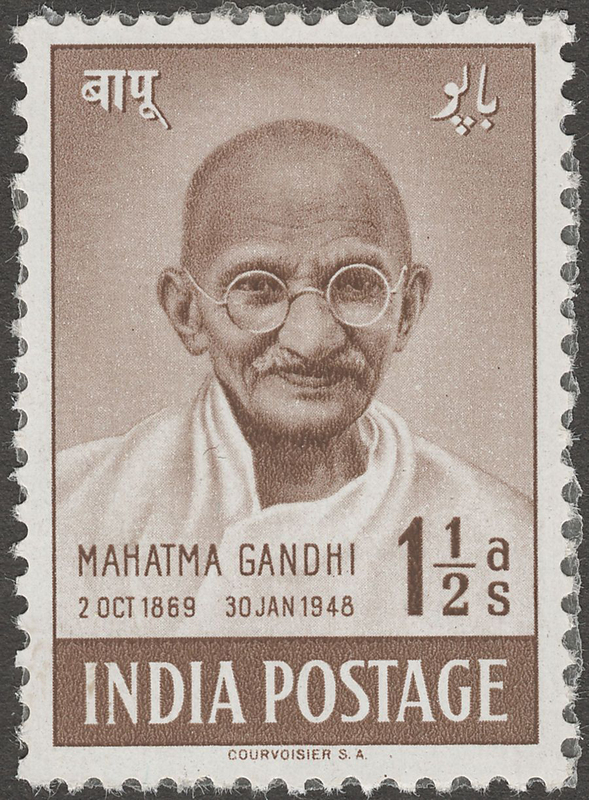 The stamps of modern India are printed in vast quantities; Indians still write billions of letters and are probably the world’s biggest users of postal stationery. Despite these huge printings, most definitive sets are awkward to collect in fine mint condition and surprisingly few generally recognised varieties appear. There are many popular themes, including ‘Mohatma’ Gandhi, ‘national heroes’ and the Military. Indian stamps have great variety, and due to the rise in the Indian economy, they have potential. There is a real Indian collecting fraternity, including younger enthusiasts, and still a strong band of traditionalist collectors of British India. 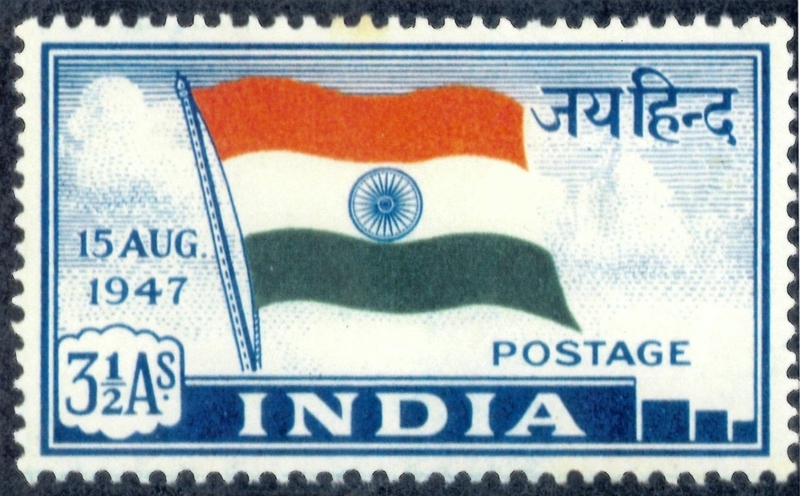 Most modern Indian stamps are also only occasionally to be found, unmounted mint, in dealer stockbooks and stock trays – always a good sign for the future.